Home / Ask Listen Retain / What Should I Be Asking My Customers? Most people have hot buttons — things that concern or frustrate them, or that they see as problems, and this is as true in business as it is anywhere else in life. The questions that you should ask are the ones that will help you identify the most important hot buttons (typically somewhere around three to five) that your top customers have when it comes to doing business with you. As you identify your top customers’ main hot buttons, you will also want to identify at least one or two current solutions to those hot-button problems. This will give you an initial framework on which to build a solid relationship with your customers. Why do you do business with us, and why did you start coming here in the first place? What do you like most about doing business with us? What do you find frustrating about doing business with us? What do you like about our competition? What products or services should we add to what we already offer? How frequently would you like a visit from your sales representative? Do you feel like a valued customer? Does our sales manager listen to you? Is our phone staff helpful? Do we come through for you the way that we say we will? The truth is that whatever business you’re in, there’s always somebody who’s willing to low-ball prices — at the expense of quality and service. But you can’t let that stop you in your tracks, and there’s no reason why you should. Customers who focus strictly on price aren’t seeing the value that separates you from your competitors; when they don’t see value, the only thing that they have left to compare is price. It’s your job to show your customers what kind of value you do have to offer — to show them how you give them what they really want. If you do this — if you connect with them on an emotional level — they won’t worry about price, because they’ll be happy with what you’re giving them. 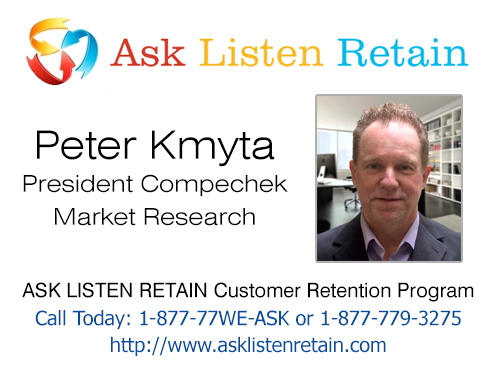 Compechek’s ASK-LISTEN-RETAIN system is designed to find out what your customers want, and to provide you with a roadmap that will get you to where you want to be: That sweet spot where you’re giving your customers so much value that they don’t even want to think about price.